Gardeners and landscapers, municipalities and craftsmen – For these professions we have primarily developed our new Lupriflex® safety shoes. 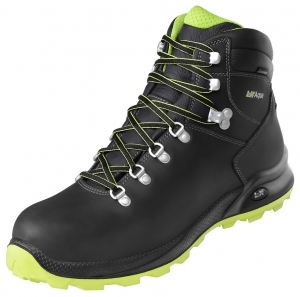 The shoe Aqua Light Low and the mid-cut boot Aqua Light Mid are lightweight, waterproof and of universal use. In size 42, a shoe weighs 600g or 680g, which is quite new for a sturdy model in this work area. The high-quality waterproof cow leather is quite durable and easy to care as the upper barely has seams. These S3 safety shoes are metal-free and feature a fiberglass toe cap and a synthetic, puncture resistant insert. The abrasion-resistant and slip-resistant light green rubber outsole has a shock absorbing midsole made of polyurethane.